The Church of the Holy Sepulchre in the Old City of Jerusalem reopened on Tuesday after a three-day closure due to an unusual stalemate. 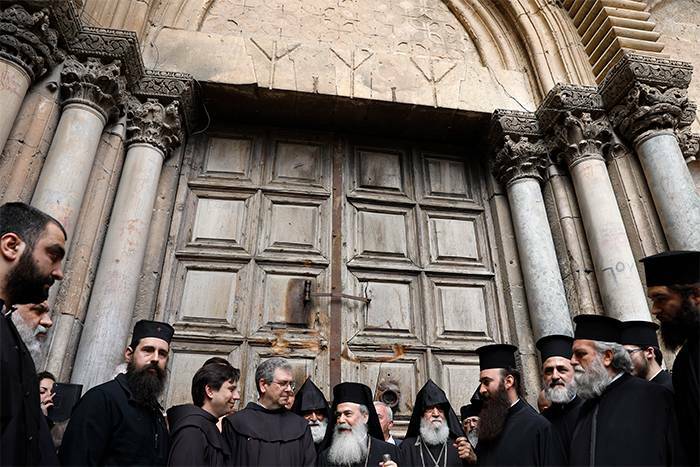 The church's doors were shut in protest against a new tax policy and an Israeli bill to seize properties the Greek Orthodox Patriarchate of Jerusalem had sold to private real estate firms. The Roman Orthodox, Catholic and Armenian churches decided on 25 February to close the church "until further notice", or Israel backtracks, in other words. The church's doors were reopened after Israel decided to shelve the disputed measures. Church leaders have issued a joint statement in which they praised the "constructive intervention of the prime minister" Benjamin Netanyahu. The Church of the Holy Sepulchre is the most sacred site for Christians around the world. It was built where Jesus is believed to have been crucified and buried before his resurrection. It is run by the Eastern Orthodox, Roman Catholic, and Armenian Apostolic sects. The Jerusalem Municipality enraged the Christian community when it imposed a new tax called arnona on 882 properties owned by the three churches. It had been the first time for Israeli authorities to tax churches since the 1967 occupation of East Jerusalem. According to Jerusalem mayor Nir Barakat, it is illogical to keep exempting those commercial assets, which include hotels and companies owned by the churches. He stressed that spaces of worship would still enjoy tax exemption. In retrospective action, Barakat said the churches must pay NIS 700 million ($190 million) in late taxes. Meanwhile, the municipality confiscated NIS 30 million (around $8 million) worth of assets and bank accounts belonging to the Greek Orthodox Patriarchate over the outstanding payments. Amid a wave of protests, Netanyahu stepped in to halt the municipality's procedures that took place over the past weeks until both parties reach a settlement. MP Rachel Azaria has put forward a draft law allowing the state to own the parcels of land sold by the church to private firms in 2010. An Israeli ministerial committee was scheduled to look into it on 25 February but the date of the discussion has been indefinitely put off. Those who have prepared the bill say it aims to protect the tenants of the houses situated on this land from the prospect that the companies, the new owners, will opt out of extending their contracts. On the other hand, the churches which own large swathes of land in Jerusalem believe the new law will fend off investors' interest in buying their properties. They also said it might cause their assets to be seized. According to Netanyahu's statement, a team headed by cabinet minister Tzachi Hanegbi and consisting of all involved parties will seek to reach an agreement, a step the three churches have warmly welcomed. "The churches look forward to engaging with Minister Hanegbi, and with all those who love Jerusalem to ensure that our holy city, where our Christian presence continues to face challenges, remains a place where the three monotheistic faiths (Judaism, Islam and Christianity) may live and thrive together," their joint statement reads. Many have seen these coming talks as a victory for the churches over Israeli authorities, with some recalling a dispute that saw Israel last July decide under pressure to remove metal detectors it had placed at entrances to Al-Aqsa Mosque compound. "The churches beat the occupation in this battle," said Dimitri Diliani, the head of the Palestinian National Christian Coalition, adding that Israel had waged a war against all non-Jewish communities. Leaders of the three churches amid the impasse described Israeli actions as a "systematic and unprecedented attack against Christians in the Holy Land". Greek Orthodox Patriarch Theophilos III, Armenian Patriarch Nourhan Manougian and the Custodian of the Holy Land Fr. Francesco Patton said the Jewish state looked to decrease Christian presence in Jerusalem. Palestinian authorities also described the Israeli-imposed taxes on churches as a fresh act of "aggression targeting Jerusalem". Meanwhile, Jordan's Foreign Minister Ayman Safadi announced his country's support for Christians in Jerusalem against the Israeli measures that "target churches' properties" and threaten the Christian existence in the holy city. The ongoing saga has reopened a debate over the churches' policies on selling properties to Jews. Adi Bajali, a member of the Orthodox Central Council (Palatine and Jordan), has called on churches to unveil all the details of the land sale. Bajali has panned church leaders, labeling them "brokers" who have misappropriated endowments and normalized relations with the Israeli occupation while totally neglecting all religious and national considerations. The Orthodox Patriarchate is the second largest land owner in the territories occupied since 1948, right behind the Israel Lands Authority. It has sold plots of land in Jerusalem and elsewhere to Jewish companies as well as groups supporting Israeli settlement blocs. The Times of Israel has published a lengthy report in Arabic on the parcels of land that the Greek Orthodox Patriarchate has sold and leased to foreign companies headed by Jewish investors. The report reveals that David Sofer, a Jewish Israeli businessman living in London and a leading partner of Kronty Investments Ltd, has given a financial boost to many of the companies that bought or rented parcels of land from churches, particularly in Jerusalem. Also, the report said New York-based Jewish billionaire Michael Steinhardt had bought a plot of land from the church through a company named Oranim Ltd. Through the same company, Sofer and Steinhardt -- both also own Abu Tor Properties Limited -- have rented a plot of land from the church in the First Station in Jerusalem. Sofer and Steinhardt have maintained very close ties with Theophilos III since he was elected as the Greek Orthodox Patriarch in 2005. Both tycoons helped him pay off inherited debts that amounted for NIS 160 million ($45,5 million). At the time, the Israeli government was sill adamant not to acknowledge his authority, before it had a change of heart in 2007. What has stirred controversy the most among Jews is that the sold land in Jerusalem is where residential buildings are located, two of which are in the neighborhoods of Givat Oranim and Abu Tor, and are owned by Oranim Ltd and Kronty Investments Ltd respectively. There are other buildings in Talbieh, Rehavia and Nayot owned by Nayot Komemiyut Investments, a company that does not belong to Sofer and Steinhardt, the report explains. Some 1500 families live in these areas whether in rented houses or apartments. After the sale, the tenants no longer know who the owners are, and whether they will extend their contracts or increase the rent. Hence, MP Rachel Azaria has introduced the draft law allowing the state to confiscate this land by paying financial compensation to the owners. Justice Minister Ayelet Shaked has backed the bill. The Times of Israel's report suggests the patriarchate owns around 20 percent the Old City of Jerusalem's land, yet it does not generate enough money on a monthly basis to pay salaries, fund educational organizations and maintain a large number of churches and monasteries. The Orthodox Patriarchate is an independent entity and does not receive financial support from the Greek government, unlike the Catholic Church which is backed by the Vatican. Since the establishment of Israel, the patriarchate's financial situation has taken a turn for the worse due the mass emigration of its followers to other countries; today, there are only 3,000 orthodox faithful out of the 10,000 Christian population in Jerusalem. Consequently, the patriarchate started leasing and selling its properties. 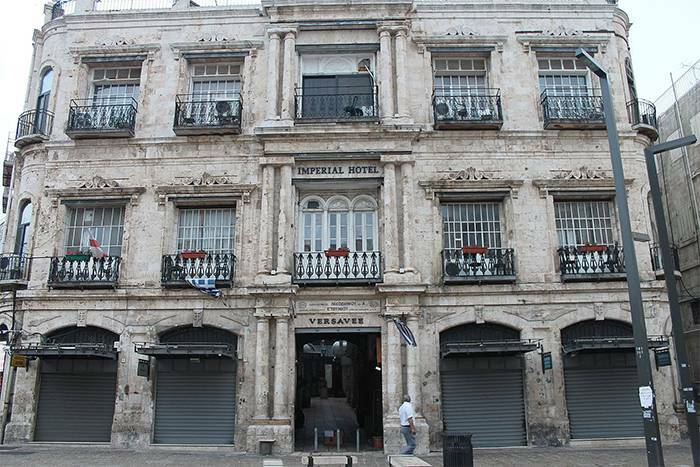 Arabs have particularly protested against the lease on Imperial and Petra hotels, located between Jaffa Gate and the entrance to the Old City's market. They include 22 commercial shops and are leased for 99 years to three holding companies owned by the Ateret Cohanim organization, which is committed to settling Jews all over the Old City. The Jaffa Gate deal was signed by then Patriarch Irenaios -- the predecessor of Theophilos III -- and he stepped down as a result in 2005. In August 2017, a Jerusalem court issued a landmark declaration that upholds the deal, even though the church has sought to back out of it citing bribery and corruption. Theophilos III described the ruling as a serious violation. However, Alif Sabbagh, a Palestinian researcher on Orthodox endowments, found Wikileaks documents that indicate the US and Israel have accredited Theophilos III as the new patriarch in return for his silence over the Jaffa Gate deal. According to one of the documents, Theophilos III told the US political attaché on 18 December 2007 that he would honor all previous agreements with the Israeli government and would deal with the hotels case only from a legal standpoint. In general, Arabs have deplored the sale of church proprieties to Jews and accused the patriarch of corruption. The Orthodox Central Council is the most prominent group opposing such a trend. Israel designates plots of land owned by the church for agricultural or industrial activities in order to prevent the latter from erecting buildings. Critics of the Orthodox Patriarchate say it has sold properties at lowered prices. Church sources, however, explain that these properties are on long-term leases, meaning the investors will not be able to use them until the expiry of these contracts and thus paid less than the market price. For instance, the patriarchate has sold around 430 acres in Caesarea to Saint Ventures Limited only for $1.5 million, given that it has leased this parcel of land to Israeli authorities for 135 years since 1974, excluding a park and a plot designated for cultivation. The patriarchate's properties leased to Jews have been a protracted feud; since 1951, it has leased a parcel of land to the Jewish National Fund. What has recently added fuel to fire is that not only does the patriarchate deal with official Israeli bodies, but with the private sector as well. More importantly, it has also been putting plots of land up for sale. Some detractors accuse the Greek Orthodox Patriarchate of polishing Theophilos III and giving him the image of a patriotic religious figure rather than an accomplice who sold Palestinian land to Jews.